Bipolar research is a multiple area research. Studies cover various fields associated with the disorder. Genetics, brain imaging techniques and biochemical studies are being collaboratively studied by the leading brains of the country in premier medical institutions. Their discoveries will help in diagnosing as well as treating these patients not only in this country but also the millions of people afflicted across the world. Bipolar treatments have greatly improved from heavy doses of tranquilizers a decade ago to the modern day mood stabilizing drugs. 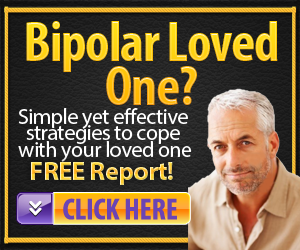 Additionally, treatment includes counseling which therapeutically handles bipolar disorders. bipolar definition to have a clear idea of what this mental illness is all about. Bipolar definition states that it is as a psychiatric illness that describes a category of mood disorders which has extremes of medical conditions. There are radical emotional changes which are characterized by abnormal heightened mood which are clinically referred to as mania or hypomania, if the occurrence is milder. The other extreme emotional change is the depressive episode where the individual has a low feeling or mixed episode which includes a mixture of low and high emotions. Bipolar I is . Bipolar disorder is defined as one or more occurrences of variation in the behavior, energy level or method of performing everyday life activities. This is defined as manic-illness or depression. When a person has experienced one such mood swing in his life then, he is labeled as Bipolar I (Bipolar One) type. Bipolar disorder is a disorder of the brain. The person goes through bouts of very high mood swings, becoming irritable, overly enthusiastic in handling issues, overly impulsive and speaking so rapidly that the listener is unable to decipher the speech. Bipolar disorder treatment is possible only with the help of the psychiatrists. When you're in the grips of an ongoing bipolar episode, there really isn't much you can do to help yourself. Therefore, any positive attempts at self-help would be on an ongoing basis to try to prevent episodes. Sometimes people with bipolar disorder, depression, and other mood disorders have episodes when they feel extremely sad, hopeless, anxious, or confused. When these emotions get too intense, the person may harm themselves with acts of self-injury. Testimonials of those who support a loved one with bipolar disorder and agrees with medication. Testimonials of people with Bipolar Disorder who agree with taking medication for their disorder and some of their experiences.